For the first time in history (as far as we can tell, that is), one person will attempt to do his thing in two races in a single day. He will attempt to summon up the energy and courage to maintain his edge over the course of 1,000 miles of racing. 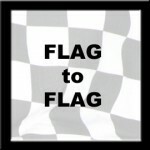 That person is Nick Bromberg and his vehicle of choice is the RacinToday blog known as Flag to Flag. God speed, Nick. Check back here on Sunday, just prior to the start of the Indy 500 to be a part of the action!